Antibody discovery platforms have come a long way since the initial steps toward understanding what antibodies do and how to harness them. 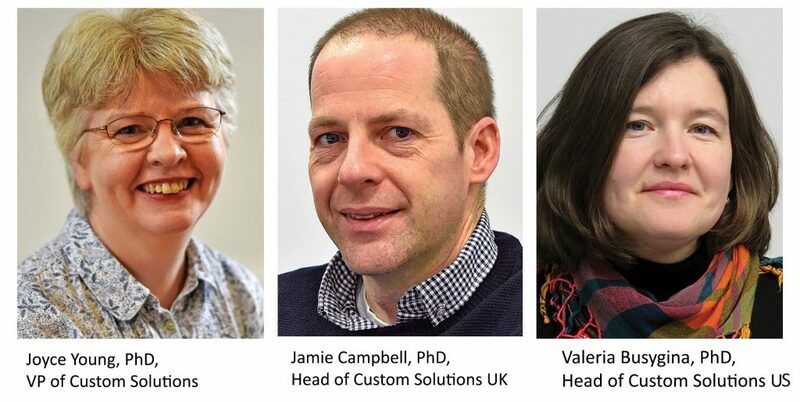 GEN recently spoke with Joyce Young, PhD, VP of Custom Solutions, Jamie Campbell, PhD, Head of Custom Solutions UK, and Valeria Busygina, PhD, Head of Custom Solutions US, three experts in antibody development platforms from Abcam. GEN: Why are antibody discovery platforms increasingly important and in demand? Dr. Campbell: In oncology, antibodies are being viewed as the mainstay of therapy. That means people are moving away from the other types of therapies, such as small molecules, which are relatively inexpensive but not as specific as antibodies. Dr. Young: The therapies coming out of antibody discovery are transformational: There are now so many different targets and combinations of those targets, to go after. Antibodies are moving into specific patient stratification to do that. Bispecifics, which are big at the moment, join different specificities of antibodies together. The industry is even using antibodies to target and reprogram T cells. Antibodies continue to be the biggest growing drug market, and you have oncology therapies coming off the back of the immunoregulatory space where antibodies, instead of targeting the tumor, are targeting misregulation of the immune system. GEN: This focus on antibodies as therapies means the tools to study them are advancing. How is this changing the way science uses antibodies? Dr. Campbell: Originally, researchers would screen large compound libraries. Now, they’re doing antibody discovery, which is more efficient. Antibodies and antibody libraries are designed and targeted so rather than fishing in a large pool and seeing what sticks; you’re stacking the cards in your favor and biasing that pool. GEN: The phage display technique—inserting a gene into a bacteriophage so that a protein of interest may be expressed on the bacteriophage’s surface—was developed back in the 1980s. For decades, the technique remained difficult and expensive, but it has started to become more accessible. What accounts for the change? Dr. Busygina: New platforms such as our AxioMx platform have sped this process up. We can now develop antibodies with the benefit of binder enrichment from diverse libraries within days to weeks rather than months or years. Phage display allows us to target those molecules that are difficult to zero in on with other methods, that is targets that are toxic or not immunogenic. It also allows for more intelligent design of antibodies by predicting the sequence that would bind to a certain molecule, and by modifying the antibodies in vitro to procure the properties we want. Unlike immunization approaches, we control the input and outcome of every phage display–based antibody discovery. It is also much quicker, so we can achieve our goals faster. AxioMx is a high-throughput phage display antibody discovery platform, using high-diversity libraries of antibody single-chain variable fragments (scFvs) fused to the P3 coat protein of an M13 bacteriophage. Our libraries are designed to allow rapid cloning to give a full IgG recombinant antibody, all created using animal-free technology. This type of antibody discovery is fast and cost-effective, and it has benefits across a wide array of applications. GEN: Another approach to antibody discovery is next-generation sequencing (NGS). The method enables the discovery of many more unique clones than traditional approaches such as hybridoma generation, resulting in a pool of rationally selected antibodies. This technique gives researchers access to a comprehensive database of antigen-specific binders, helping to increase the chances of identifying the best antibody for the task at hand. Tell us about your NGS Platform? Dr. Young: It took us six to eight years to develop our NGS platform. Much of that was around getting the bioinformatics together and applying NGS to the rabbit immune response. The rabbit immune system brings many advantages, with diversity generated by gene conversion in addition to somatic hypermutation. It was rather a complex beast to tackle with NGS, but it’s now a robust platform that can go out to customers. Dr. Busygina: The NGS approach allows us to look at the whole immune response in depth and breadth. It reveals what the whole immune response looks like, not just a few clones. Then, we use a bioinformatics approach to select a set of binders that will be the most beneficial to our application. GEN: Abcam has long been known as a specialist producer of antibodies. How else do you work to meet your clients’ needs? Dr. Young: Now we’re able to support our customers from bench to bedside. We’re able to take clients from wondering if what they have is a target or not, to being supplied with reagents that are produced under regulated manufacturing processes and that can be used to support diagnostics and patient stratification. Working with clients is key. Abcam develops some of these therapeutics, and we help define which patients would benefit from them. We also bring the reagents that can allow us to do patient stratification and to progress these drugs through clinical trials and pharmacokinetic analysis. Abcam provides support from beginning to end, validating the target, deriving the antibody against it, deriving support reagents, and supporting antibody drugs through development. GEN: Artificial intelligence (AI) is advancing all areas of science and technology, and one of these areas is antibody discovery. How critical will AI be in the future of antibody discovery? Dr. Campbell: Computational tools and bioinformatics are advancing at a rapid rate, not just in science but in all technology. I see these tools, in the form of AI being applied to the big data sets we now have from things like NGS. A lot of the initial analysis from an NGS library will be done using these AI tools, and that will essentially be the screening component. I can only see the NGS approach improving as our tools get better at predicting and understanding which clones we should make and select first. This means we’ll be able to screen less, give antibodies to the customer quicker, and provide them with the right tool from the start. Dr. Busygina: I am working directly with these tools in the laboratory, and I believe AI will ensure the discovery of new antibody platforms. AI will allow us to do things faster, but it will also change how things are done. Initially, DNA sequencing was a tremendous effort, but now it is cheap and easy and fast. We want to move the antibody field to a similar paradigm, where we can achieve greater success in developing specific properties in each antibody we develop. We can now generate a lot of data regarding the immune response to a particular antigen, and regarding the evolution of antibodies in vitro. I can imagine that in the future we’ll combine those two approaches to allow in silico antibody prediction. We’ll be able to predict the properties of certain antibodies or predict the sequences we’ll need to put in the complementarity-determining region to develop antibodies bioinformatically. GEN: Where will the next fundamental shifts in antibody discovery come from? Dr. Young: From combining approaches and working out where the center of the Venn diagram of knowledge and technical ability sits. Going forward, I see us being able to really harness our knowledge of the immune system. Phage display is the way the AxioMx platform has harnessed the affinity maturation stage, a clever molecular biology tool to give rapid affinity maturation—more rapid than any other phage display out there. That has meant applying knowledge of molecular biology to technology in a clever way. There’s no reason we can’t continue to do that. Synergy between different technologies is often where you get the “aha” moment and advance things, so we’re lucky to have three tremendous platforms: NGS, phage display, and RabMAb®.